The Beechcraft C17L Staggerwing was the first aircraft produced by the new Beech Aircraft Company of Wichita, Kansas. It was a gamble for President Walter Beech and Vice-president Ted Wells who was chief designer of the aircraft. Produced during the depths of the Great Depression, this expensive aircraft was designed as a high-speed, comfortable business airplane. The gamble was successful with 781 Beech 17s produced in eight different series. The aircraft was technologically advanced for its time, and the negative staggered wing arrangement, which improved the pilot's visibility from the aircraft and the airplane's gentle stall characteristics, also contributed to the design's classic beauty. Highlighted in this image are the Vertical Stabilizer and Horizontal Stabilizer of the Beechcraft C17L Staggerwing. The Beechcraft C17L Staggerwing was the first aircraft produced by the new Beech Aircraft Company of Wichita, Kansas. It was a gamble for President Walter Beech and Vice-president Ted Wells who was chief designer of the aircraft. Produced during the depths of the Great Depression, this expensive aircraft was designed as a high-speed, comfortable business airplane. The gamble was successful with 781 Beech 17s produced in eight different series. The aircraft was technologically advanced for its time, and the negative staggered wing arrangement, which improved the pilot's visibility from the aircraft and the airplane's gentle stall characteristics, also contributed to the design's classic beauty. Highlighted in this image is the landing gear of the Beechcraft C17L Staggerwing. The Beechcraft C17L Staggerwing was the first aircraft produced by the new Beech Aircraft Company of Wichita, Kansas. It was a gamble for President Walter Beech and Vice-president Ted Wells who was chief designer of the aircraft. Produced during the depths of the Great Depression, this expensive aircraft was designed as a high-speed, comfortable business airplane. The gamble was successful with 781 Beech 17s produced in eight different series. The aircraft was technologically advanced for its time, and the negative staggered wing arrangement, which improved the pilot's visibility from the aircraft and the airplane's gentle stall characteristics, also contributed to the design's classic beauty. Highlighted in this image is the vertical stabilizer of the Beechcraft C17L Staggerwing. The Beechcraft C17L Staggerwing was the first aircraft produced by the new Beech Aircraft Company of Wichita, Kansas. It was a gamble for President Walter Beech and Vice-president Ted Wells who was chief designer of the aircraft. Produced during the depths of the Great Depression, this expensive aircraft was designed as a high-speed, comfortable business airplane. The gamble was successful with 781 Beech 17s produced in eight different series. The aircraft was technologically advanced for its time, and the negative staggered wing arrangement, which improved the pilot's visibility from the aircraft and the airplane's gentle stall characteristics, also contributed to the design's classic beauty. Highlighted in this image is the landing gear bay of the Beechcraft C17L Staggerwing. The Beechcraft C17L Staggerwing was the first aircraft produced by the new Beech Aircraft Company of Wichita, Kansas. It was a gamble for President Walter Beech and Vice-president Ted Wells who was chief designer of the aircraft. Produced during the depths of the Great Depression, this expensive aircraft was designed as a high-speed, comfortable business airplane. The gamble was successful with 781 Beech 17s produced in eight different series. The aircraft was technologically advanced for its time, and the negative staggered wing arrangement, which improved the pilot's visibility from the aircraft and the airplane's gentle stall characteristics, also contributed to the design's classic beauty. Highlighted in this image is the wings of the Beechcraft C17L Staggerwing. The Beechcraft C17L Staggerwing was the first aircraft produced by the new Beech Aircraft Company of Wichita, Kansas. It was a gamble for President Walter Beech and Vice-president Ted Wells who was chief designer of the aircraft. Produced during the depths of the Great Depression, this expensive aircraft was designed as a high-speed, comfortable business airplane. The gamble was successful with 781 Beech 17s produced in eight different series. The aircraft was technologically advanced for its time, and the negative staggered wing arrangement, which improved the pilot's visibility from the aircraft and the airplane's gentle stall characteristics, also contributed to the design's classic beauty. Highlighted in this image is the Engine of the Beechcraft C17L Staggerwing. The Beechcraft C17L Staggerwing was the first aircraft produced by the new Beech Aircraft Company of Wichita, Kansas. It was a gamble for President Walter Beech and Vice-president Ted Wells who was chief designer of the aircraft. Produced during the depths of the Great Depression, this expensive aircraft was designed as a high-speed, comfortable business airplane. The gamble was successful with 781 Beech 17s produced in eight different series. The aircraft was technologically advanced for its time, and the negative staggered wing arrangement, which improved the pilot's visibility from the aircraft and the airplane's gentle stall characteristics, also contributed to the design's classic beauty. 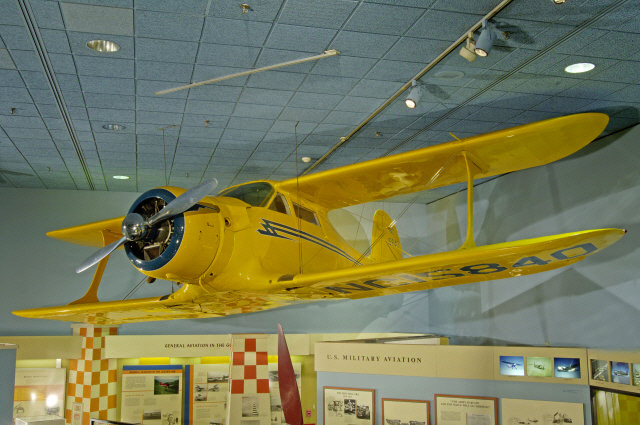 The Beech Model 17 Staggerwing on display at the National Air and Space Museum National Mall Building. The Model 17 was called the Staggerwing due to the placement of the lower wing ahead of the upper wing. The original owner of this aircraft was E.E. Aldrin (father of astronaut Edwin "Buzz" Aldrin), who worked for Standard Oil Development Company in New York City. The Model 17, the first aircraft produced by the new Beech Aircraft Company of Wichita, Kansas, was a gamble for president Walter Beech and vice-president Ted Wells who was chief designer of the aircraft. Produced during the depths of the Great Depression, this expensive aircraft was designed as a high-speed, comfortable business airplane. The gamble was successful with 781 Beech 17s produced in eight different series. The aircraft was technologically advanced for its time, and the negative staggered wing arrangement, which improved the pilot's visibility from the aircraft and the airplane's gentle stall characteristics, also contributed to the design's classic beauty. The Beechcraft Staggerwing in the National Air and Space Museum, serial number 93, was manufactured on July 3, 1936, and registered as NC15840. It was a Model C17B powered with a 285-hp Jacobs L-5M engine. The original owner of the aircraft was E.E. Aldrin (father of astronaut Edwin "Buzz" Aldrin), who worked for Standard Oil Development Company in New York City. With a list price of $10,260, the aircraft was equipped with numerous extras, including expensive instrumentation, electrical bonding, rear seat parachutes, a magneto-equipped engine, and a custom paint scheme, using the colors and logo of Standard Oil. From 1936 to 1980, NC 15840 had 19 different owners including oil companies, charter and sightseeing businesses and the CAP, for coastal patrol duty during World War II. Desert Air Parts donated the aircraft in 1981. The Model 17, the first aircraft produced by the new Beech Aircraft Company of Wichita, Kansas, was a gamble for president Walter Beech and vice-president Ted Wells who was chief designer of the aircraft. Produced during the depths of the Great Depression, this expensive aircraft was designed as a high-speed, comfortable business airplane. The gamble was successful with 781 Beech 17s produced in eight different series. There were only two of first series Model 17R Beech Staggerwings built. The aircraft had a fixed landing gear that was well faired with wheel pants and powered by a 420-hp Wright R-760 engine. It had a steel-tube fuselage and wing spar structure. The upper wing was inversely staggered behind the lower wing, and this design gave the Model 17 its unique shape and name. The fuselage was faired with wood formers and stringers and was covered with fabric. Top speed of the aircraft was more than 200 mph and yet the landing speed was only 60-65 mph. Such performance was remarkable for the time. But despite its promise, the aircraft was difficult to sell, largely because of its high cost. Clearly, some compromises in performance had to be made if it was to be more competitive. By 1934, Beech introduced the Model B17L, a new series retaining the general design of the earlier airplanes. The major modifications were the installation of a retractable landing gear, wings of a different airfoil, the use of wood wing spars instead of steel ones, and a 225-hp Jacobs L-4 power plant. The use of retractable gear, which was not common at the time, as well as parallel improvements in streamlining and weight reduction, gave the aircraft a maximum speed of 175 mph and a landing speed of 45 mph. The Beech Company advertised the performance and economy of the new series and emphasized the pilot's visibility from the aircraft and the airplane's gentle stall characteristics, both resulting from the negative staggered wing arrangement. The redesigned aircraft had hit the target, and sales improved significantly. The company also built two Model Al7s with a fixed landing gear and Wright R-1820 Cyclone engines. The engine on the second of these two powerful aircraft developed 710 hp. The aircraft had a maximum speed of 250 mph, making it the fastest commercial aircraft of its time and the fastest Model 17 ever built. Although the performance of the early Model 17s was impressive, the aircraft did not have desirable landing characteristics. The tall landing gear increased the chances of ground loops and the nose-heavy condition made three-point landings difficult. The Model C17 introduced in 1936 corrected these problems. It had a shorter landing gear, and the angle of incidence of the horizontal stabilizer was changed to keep the tail down while landing. With the Staggerwing, the Beech Corporation not only had a successful corporate aircraft, but was a winner in racing circles too. NC15835, a Model C17R, piloted by Louise Thaden and Blanche Noyes, won the 1936 Bendix Trophy Race, marking the first time that a woman had won that prestigious race. Other stock Beechcraft Staggerwings won two major air races in Miami in 1936. In 1937, Jacqueline Cochran set a 1,000-kilometer speed record averaging more than 320 kph (200 mph). Staggerwings also did well in the 1937 and 1938 Bendix Races. The Model D17 Staggerwing was the first major design change since the Model B17. The fuselage was lengthened to improve the landing characteristics by giving more leverage to the elevator. The ailerons were moved to the upper wings to prevent interference with the air flow over the flaps. The complex hand-operated wheel brakes were replaced with a simplified foot-operated braking system. These and other airframe modifications significantly improved the design of the Staggerwing. The Model D17S Staggerwing, equipped with a 450-hp Pratt and Whitney R-985 engine, was produced in larger numbers than any other model. During World War II, the U.S. Army Air Forces and the U.S. Navy purchased all the Model D17S aircraft for transporting personnel. The Beechcraft Staggerwing in the National Air and Space Museum, serial number 93, was manufactured on July 3, 1936, and registered as NC15840. It was a Model C17B powered with a 285-hp Jacobs L-5M engine. The original owner of the aircraft was E.E. Aldrin (father of astronaut Edwin "Buzz" Aldrin), who worked for Standard Oil Development Company in New York City. With a list price of $10,260, the aircraft was equipped with numerous extras, including expensive instrumentation, electrical bonding, rear seat parachutes, a magneto-equipped engine, and a custom paint scheme, using the colors and logo of Standard Oil. The company installed a two way voice radio and a radio compass for navigation, equipment essential for a corporate aircraft. NC15840 was damaged and repaired many times throughout its flying career. Several repairs to the wings were the result of the aircraft's ground looping tendencies. In due course the hand operated brakes were replaced with toe-operated brakes. Shortly after World War II, the aircraft was changed to a Model C17L, with the installation of a newer 225-hp Jacobs L4-MB engine. Even though the Jacobs L4-MBengine had 60 less HP, its installation had negligible impact on aircraft performance due to its adaptability for a much more efficient controllable pitch propeller system. From 1936 to 1980, NC 15840 had nineteen different owners. It was operated by several oil companies as well as by charter and sightseeing businesses. During World War II, it flew coastal patrol duties with the Civil Air Patrol. Between 1961 and 1980 the aircraft was inactive. In 1981, it was donated to the National Air and Space Museum by Desert Air Parts of Tucson, Arizona. The fact that NC 15840 survived so long is a testimony to the masterful design of Walter Beech, Ted Wells, and their associates. The aircraft was technologically advanced for its time, and it will always remain a classic beauty. Donated by Desert Air Parts, Inc.
NC15840. Five-place executive biplane with distinctive negative "staggered" wings. Jacobs L-4MB radial engine. Staggerwings were also used as a racing and World War II military transport aircraft.